With the kids being on summer break, this is definitely the season for memories to be made in New York City. Play and enjoy yourself with the whole family with these unforgettable activities across New York State with the best part being that they will not break the bank. Thanks to M&T Bank, you can enjoy Buffalo’s hottest culture spots every Friday for free. Enjoy free access to the Albright-Knox Art Gallery on every first Friday of the month, Burchfield Penney Art Centre on second Fridays, the Buffalo History Museum on the third Friday and on the fourth Friday of each month the Buffalo Arts Studio. Thereby is you are visiting New York City on a shoestring budget, this is definitely the place for you. To hike New York City’s tallest mountain, Mount Marcy, travel to the Adirondack High Peaks Wilderness Area. Have a 5K-mile high picnic with the whole family once you reach the peak of the mountain. The mountain varied terrain, from beginner hikes to more challenging hikes, therefore it is best to choose the terrain that is right for your family’s experience level. Your kids will love to make their friends jealous and boasting about this feat. From a small avalanche to thundering falls which drops hundreds of feet down, Ithaca is home to more than 100 majestic waterfalls that will leave you speechless. The kids can also swim at the base of Buttermilk Falls which is an all-natural swimming pool! 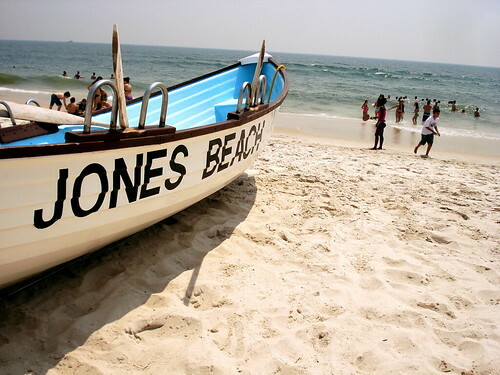 Make your way to Jones Beach to get a break from everything and immerse yourself in an intriguing collage of waves, sand dunes and maritime forests. It consists of fun boardwalk, playground and an 18-hole pitch putt golf course, especially for the kids. Visit the New York State Capital building, which is a National Historic Landmark for over 100 years simply by taking a trip to Albany. Learn more about our great state’s government. You will teach your kids the next lesson of their history class by visiting here. Paddle of simply take a swim at Sandy Beach, which is found in the Thousand Islands-Seaway region. In North-eastern US, this is the only significant freshwater dune site. Bring along some pool toys to create and compete in the sand castle-building competition for the kids. Your kids can explore their imagination at the nearby Alexandria Bay, where a pirate event is taking place between August 12-21. Eat your Sunday morning brunch with a view at Bear Mountain State Park, where fishing, hiking trails and other outdoor activities await. For the kids to run and mess around at the playing field, bring a ball or otherwise you can visit the Bear Mountain State Park zoo. You can even do a little landscape painting at the craft dock if you wish to. Spend a day, or possibly a week, bird-watching and fishing at Alma Pond, which is plump with largemouth bass, carp, sunfish and bullhead alike. You can either paddle on the water or fish from shore. You are sure to see many species of colourful birds here so the best thing is to bring a bird book and made an educational game out of it for the little ones. Note: in New York, fishing requires a special license. So if you do not have one, you can purchase a one-day pass online for $5-$10. By comparison, you will feel irrelevant to the majestic grandiosity of Niagara Falls. Get up close and person with 600,000 gallons of water falling every second. It is and unforgettable experience, especially for the kids. Head over to the Erie County Fair, after you catch a glimpse of the water wonder, which is a mere 30-minute drive – for farm animals, music, rides and more. It is open on August 10-21, and the fair is free for kids. Wander a breath-taking vista or it on a quaint covered bridge over a babbling brook and absorb in all the fresh air and calm vibes that springtime in New York City offers. If you are looking for a fun place that is suitable for the whole family, then the Bear Creek Restaurant and Recreational Park is the choice for you as it is equipped to handle the whole family. Including a mini golf course, driving range together with a paintball complex. Note: at certain locations, parking may not be free. See what New York City is all about by viewing the beauty of Manhattan on a free tour by foot, while meeting fellow tourists.